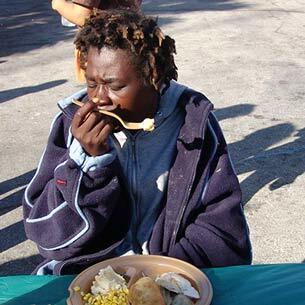 Help hurting men, women, and children in the greatest of need with your special new year gift. 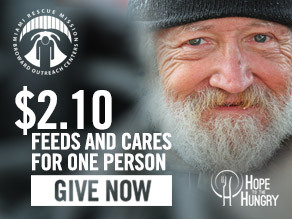 Help show the hungry, homeless and needy that people care with a special 2019 Winter Survival Gift. Every $2.10 provides a hot, nutritious meal for someone in need. We believe that "Hope often begins with a Meal". It's hard to speak to someone about changing their life when they are hungry, tired, and hurting. Your special, "2019 Winter Survival" gift will bless thousands. . Your SPECIAL GIFT will bring more than just a meal - it will bring Hope and more importantly a chance for a man or woman to start a new life in the New Year. The message that God and people care for people who are struggling. Food, clothing, and shelter to those in great need. Tools and knowledge to help restore lives and to transition back into society. Matthew 25:34,35: "For I was hungry and you gave me something to eat, I was thirsty and you gave me something to drink, I was a stranger and you invited me in,I needed clothes and you clothed me, I was sick and you looked after me, I was in prison and you came to visit me." Thank You for giving so that your 2019 Survival gift can be shared with those in the greatest of need. Your gift will bless people who are struggling and will help break the cycle of homelessness. Proverbs 19:17 : "Whoever is kind to the poor is lending to the LORD— the benefit of his gift will return in abundance."